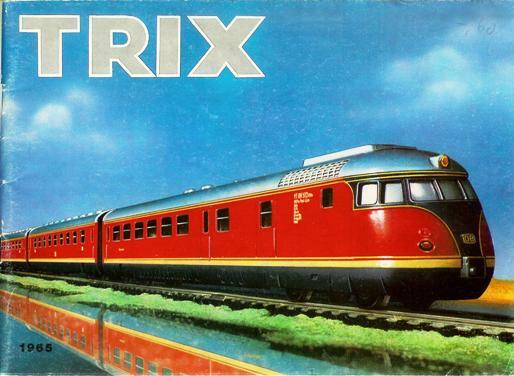 It is not clear exactly when Minitrix first appeared on the model railroad scene (although many feel that it was 1964), but it does appear in the 1965 Trix catalog. 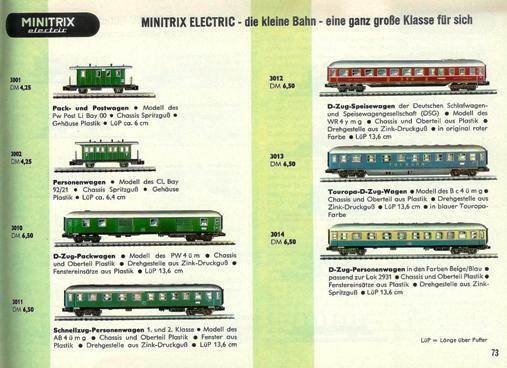 There were actually two Minitrix product lines in that era, Minitrix and Minitrix electric. The Minitrix in the 1965 catalog were cast-metal floor toys, while the electrically powered Minitrix was identified as such. 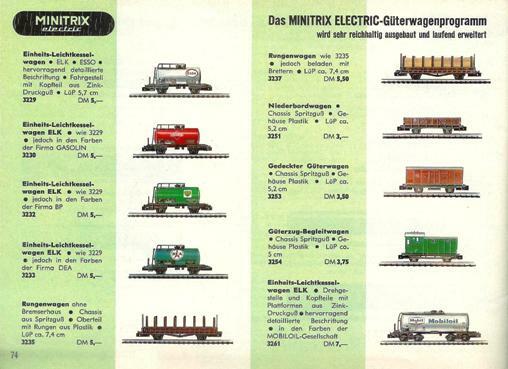 In subsequent years, the floor toys were discontinued and the electrically powered N-Scale trains became simply Minitrix. These sets included an oval of track. 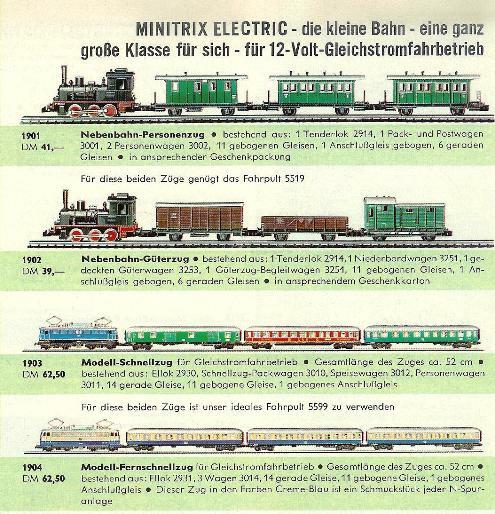 There were three different locomotives in the early Minitrix product line. The steam engine was an old-time Prussian State Railways T3 class. There was a B-B Class E 10 electric in three different liveries and there was a VT98 railbus and trailer. 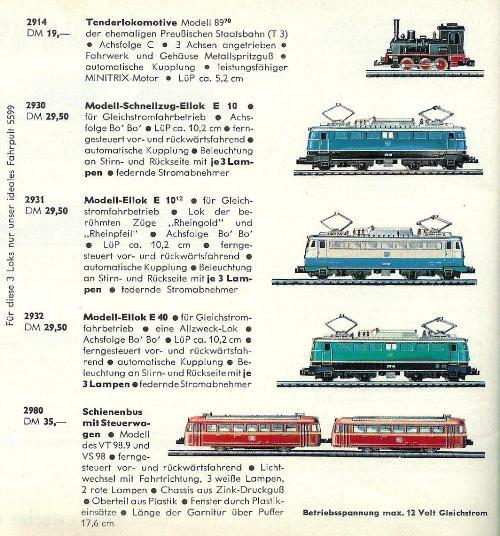 There were several German passenger cars, both oldies to go with the T3 and contemporary cars to go with either the blue or blue & cream (Rheingold train colors of that era) E10’s. There also was a nice range of freight cars to go with the green E 10. 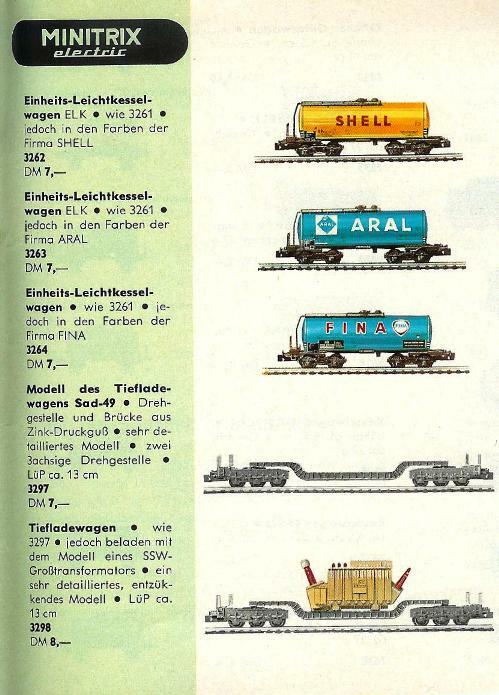 There also were basic track items. 6 straight track pieces, ranging in length between 50 mm and 312.6 mm. Two different radii of curved track. Manual and remote turnouts for one radius curve. Electrical components were shared with the H0 product line. In all, an auspicious start for this new line of N-Scale trains.